Eclectic pop, country, and fiddle music. The Big Cheese is a father-daughter band. Larry Rice (Father), the musical mastermind, plays fiddle, mandolin, guitar, bass guitar, vocals and banjo if need be. Shannon Rice (Daughter) is on drums, keyboards and percussion, and Lea Rice (Other Daughter) plays guitar, keyboards, banjo and sings. All three are lifelong Virginians and proud of it! Shannon and Lea were lucky to grow up with a massive variety of musical influences flying around airwaves of their house – from the Beatles to Taj Mahal to Lynyrd Skynyrd. 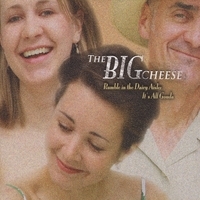 As a band, the Big Cheese performs a diverse catalog of traditional and contemporary songs and musical styles, combining them so that each song can be heard in a new, sometimes upturned, way. In other words, we take as many musical styles as we can, throw them at the wall and see what sticks. In one night we will go from a rootsy original to some coffeehouse Sinatra to toe-tapping Klezmer to Stevie Wonder and back again! Sadly, we haven’t performed underwater yet but we’re working on it. We’ve played at Tiffany Tavern and Cameron Perks in Alexandria, Bangkok Blues and Stacy’s Coffee Parlor in Falls Church, Brewer’s Alley in Frederick, Md. and a handful of parties in Alexandria too. Funny you should ask that. It was kind of a mistake. Larry and Lea were thinking of possible names and not coming up with anything great. Lea, who claims temporary insanity, suggested “Big Cheese;” mostly in reference to Larry’s fondness for cheesy jokes. There could also have been a large piece of cheese sitting on the kitchen counter, who knows. “Great idea!” said her father, prompting her to quickly and desperately attempt a retraction, but the name stuck and we are … The Big Cheese.